Last year I wrote about choosing our daughter’s first car using 9 criteria. Less than a month later Toolmongers read about “The Dent” and what a non-event it turned out to be, thanks to these criteria. Now, a year later, it’s time for an update. What other bumps and bruises did the car receive? How did the car’s mechanical systems hold up? Did our daughter ever find out how fast it could go? Basically, did the 9 criteria work, and how exactly did our teen’s first wheels fare during a year of use? I’m happy to report that the vehicle remains mostly in one piece. There were no further accidents, no trading paint, and no rubbing bumpers over the course of the year — at least none that I know of. All that is more of a testimony to our daughter’s safe driving practices than anything the car may have offered. She hasn’t been given any tickets or gotten herself too lost — and in the end it doesn’t matter what car you drive, as long as you drive it safely. Maintenance on the now over-200,000-mile-mark car has been almost hassle-free. Last November our daughter found herself in the middle of a busy downtown intersection with an engine that wouldn’t run — “The Stall.” Using our insurance’s free towing plan, we had the car towed to a nearby garage (thank you USAA!). The garage replaced the ignition wires and spark plugs for us due to time limitations. The engine purred back to life and our daughter’s freedom (and good mood) was restored. Shortly after “The Stall,” we gave the car a new set of rubber to help negotiate the slush, snow, and ice that never really came last year. There were also a few regular oil changes and new tires, regular mundane maintenance that any car requires. And I’ll probably change out the brake pads later this fall when I have a free moment. Aside from “The Stall” the only other major item that required attention was the exhaust system. In April the sound of our daughter’s Camry cranking up rivaled the sound of our neighbor’s Diesel Pulling Truck. The cloud of vapor emanating from beneath the car on a cold morning rivaled San Francisco skies. Multiple pipes had leaks, and what was left of the muffler was barely attached to the car. It turns out the previous owner had gone through this once before and had a cheap custom exhaust system installed that couldn’t be salvaged. The entire system needed to be replaced and has been by far the largest expense in parts alone (about $850). While we were at it, we also replaced the radiator hose. 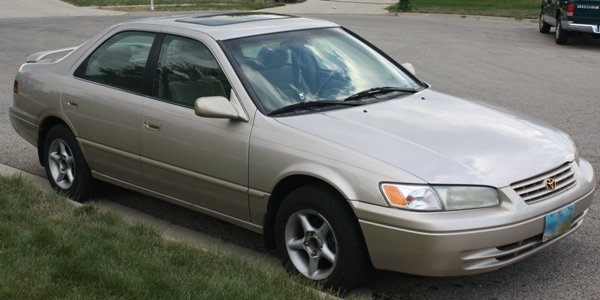 So, aside from a few hits to the wallet, our daughter’s Camry is still running, the transmission is still shifting, and the body is still holding together thanks to the criteria we used when shopping for it. Fortunately there has been no test to the car’s safety features yet and the gas mileage remains good. For now our high school-graduate daughter has decided to save some money and commute to a local college while living at home this year. Hopefully we’ll get one more good college year out of our teen’s first wheels. I can only hope our son’s first wheels fare as well. Who knows it may become your son’s first wheels as well.